Last month I was asked to write a review of the film Bad Actress for a new magazine in Los Angeles. This publication had a section of reviews emphasizing rare/weird/cult movies. I was provided with a list, none of which I’d ever heard of, and chose the one with Sabrina the Teenage Witch’s aunt in it. After watching the film, I wrote my review. Instead of taking my long and conversational approach, like what I do for this fine blog, I tried to make it sound like a blurb you’d see in a small entertainment paper. It was a fun exercise. The editor rejected it for being too negative. He said I made the director come off as stupid and the movie sounds like a waste of time. Apparently he wanted totally positive reviews. My guess is so not to piss off potential investors. At his request I tried again. Still, he rejected it. Instead of compromising my view further I thanked him for the opportunity and said, “I’m sorry but I have to review the film honestly. I went as far as I could promoting the good about the film, but I also told the truth. I think that people respond well to honest and fair criticism. Offering a solely positive outlook when there are obvious flaws to the work comes off as untrue. Well, it may not be in some fancy L. A. based art magazine, leaning towards hipster pandering, but it was still a fun experiment, and I get to share it here, amongst others who appreciate honest criticism. After the accidental death of his daughter, appliance salesman, Bernie Pillage (Chris Mulkey) has the epiphany that he has been frugal with his life and decides to cut his family off from his finances in order to donate it all to a cult. In response, his once TV star wife, Alyssa Rampart-Pillage (Beth Broderick), plots with his cousin, and business partner, to murder him before he can cut everyone out of his Will. What follows are a stream of antics by desperate and greedy people to both hide and uncover the truth. 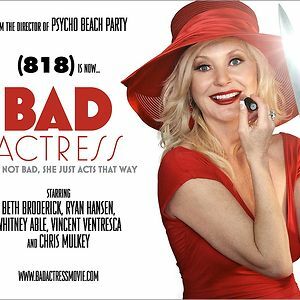 Bad Actress is a twisted satire which brings to mind the films of Richard Linklater, John Waters, and the Coen Brothers, without ever reaching their sophistication, wit, edge, or joyous exploitation of the bizarre. The trailer for the film would have you believe that it is a “so bad it’s good movie” on par with Tommy Wiseau’s “The Room”. Thankfully it is not. Instead it is a black comedy that is never really smart enough to have any bite, or funny enough to keep you laughing. The cast helps to keep the material afloat. Each actor devotes themselves to their characters enough for us never to be confused about who we’re watching and what they’re doing. However, the Why of it all is never exactly clear. There is no indication whatsoever regarding what is so wonderful about her life that would drive Alyssa to commit murder. Her surviving children, Rebecca (Whitney Able) and Russell (Ray Hansen), hated their father and their lives, and had no real reason to want to expose their mother’s crime. This makes investing in their actions very difficult. In the end, Bad Actress, is a parody of celebrity without a message. It seems to condemn those who seek fame by any means without ever having it say anything about show business. There is one comment towards the end which brings up the concept of society’s ability to look passed a celebrity’s crime, but the topic is never demonstrated further. The film is never boring. It has a few lines of pretty snappy dialogue. The characters motivations may be unclear at times but the actors give us enough to enjoy about them to keep us interested. It’s a movie that isn’t quite sharp enough to be great, or dull enough to be a failure. Best viewing conditions would be with a bunch of liberally inebriated friends, or on a lonely night with nothing else to do. That’s not negative. It’s truthful. It’s almost like saying “it’s not bad, but it won’t change your life, either.” Sounds like something I’d watch on Netflix at a friend’s house after a few beers. We used to do that all the time; “Bad Actress” may have the potential to be one of the better films we’ve seen under those conditions. Too bad you couldn’t be the editor. Good review, Dustin! I’m guessing it was probably the comparison to The Room that bothered them. No director wants to be compared to Tommy Wiseau. Thanks Gabe! My comparison to The Room came from the trailer. That was an awful piece of work. It looked like Wiseau’s follow-up. That’s why I also stated that luckily the film was not like it’s trailer. Whatever though. And you know, it’s a shame people hate Tommy. I’m kind of obsessed with The Room. The same way other people love Plan 9 From Outer Space.